Pearl Yachts and their dealers for the US, Atlantic Yacht and Ship Co. will be at the upcoming Palm Beach International Boat Show where the Pearl 80 will be on display at Ramp 2, Slip 224. Featuring hull design by Bill Dixon and interiors by Kelly Hoppen MBE, the Pearl 80 is an ideal luxury cruiser for the Americas. Pearl Yachts and the Atlantic Yacht and Ship Co. will be at the upcoming Palm Beach International Boat Show, scheduled from March 28th – 31st, 2019 where the Pearl 80 will be on display at Ramp 2, Slip 224. 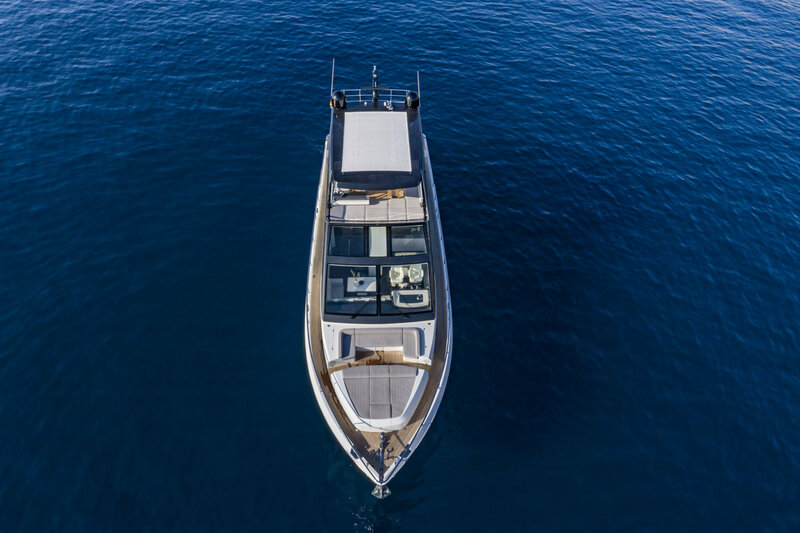 The Pearl 80 has features such as a jet ski garage, a hydraulic bathing platform and a flybridge fully equipped for outdoor entertaining that make it ideal for the Americas. The Pearl 80 can accommodate eight guests in four en suite cabins and features an en suite crew cabin for two complete with a laundry area. Owners can choose between four power options for a top speed of up to 35 knots. With hull design and exterior layout by naval architect Bill Dixon and styling and interiors by Kelly Hoppen MBE, the Pearl 80 is a sporty and voluminous yacht that was built for sun and fun. From the large and protected aft cockpit, full height glass doors lead to a bright and chic saloon with a huge L shaped sofa, ottoman and a bar. The galley wall lowers on to the saloon allowing light and views to flood the interior. Lower deck guest accommodation includes a large owner’s suite fore, two twin cabins amidships and a full beam VIP further aft. Owners can choose between three décor options designed by Kelly Hoppen with chic, clean lines and neutral nuances. There are outdoor dining areas with banquette seating and solid teak tables on the main deck aft and flybridge and a dinette next to the helm and galley as well as on the foredeck. On top of a dining area, the flybridge has a helm station and a bar with a bbq, fridge and icemaker. The Americas are this yacht’s element. The Pearl 80’s fine Dixon designed ‘V’ hull and 55 tons displacement make the yacht stable in chop and current and with a cruising speed of 25 knots she accelerates smoothly to her top planing speed of 35 knots.